As I mentioned in the previous post, this weekend I am working at our local fair in the needlework section. The work prior to the fair, taking in the entries, and putting together the final display is the hardest night, which happened on Thursday night. This year we were able to leave by 10:30 p.m., which was our earliest night ever. We have learned to cut the time down by waiting until Friday afternoon, prior to the gates opening, to set up the display on the table portions. 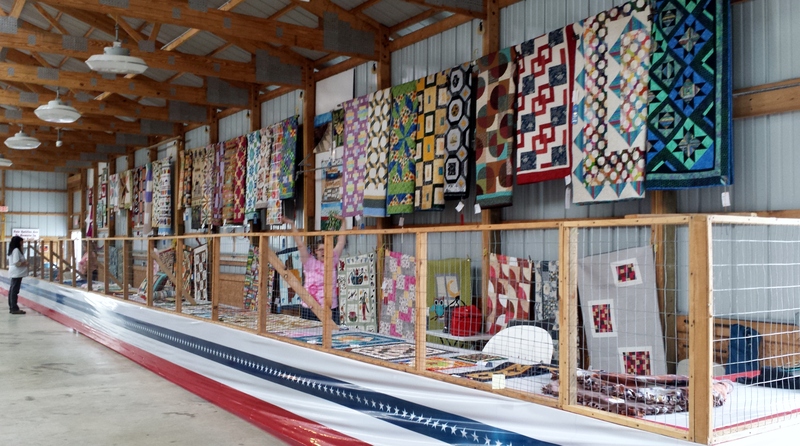 We had great help this year with taking in the entries, tagging, and judging, and hanging the quilts on the wall. The building that we display in is great! It has a high ceiling, with skylights and good lighting so for a country fair is really amazing. 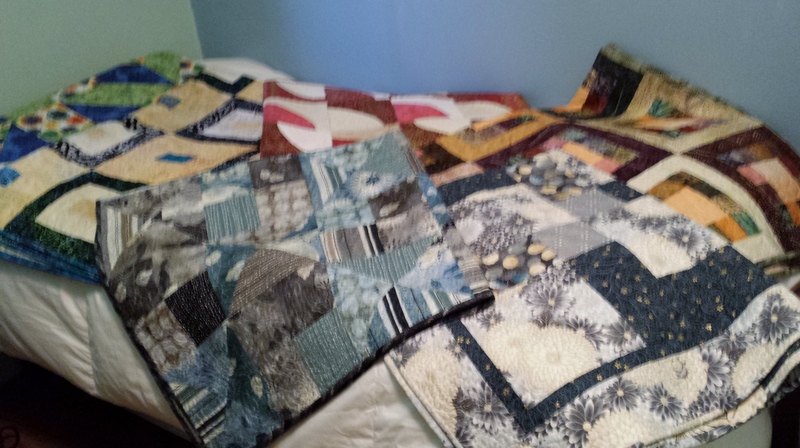 We have the quilts that are displayed on the wall on a pulley system that my husband set up when the building was new, 7-10 years ago. Anyway for today, I will share the before and after shots for the needlework display. This is the before photo of our area. 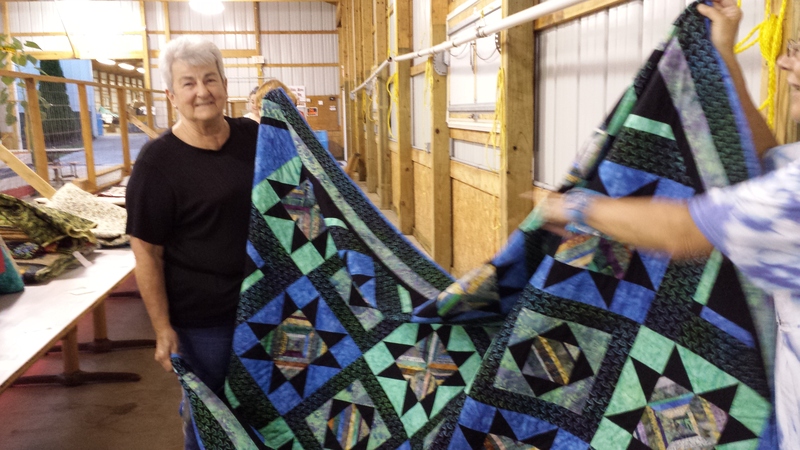 This is a picture of one of my Quilt Guild friends helping, Cathy Mitchell. This is the after photo. 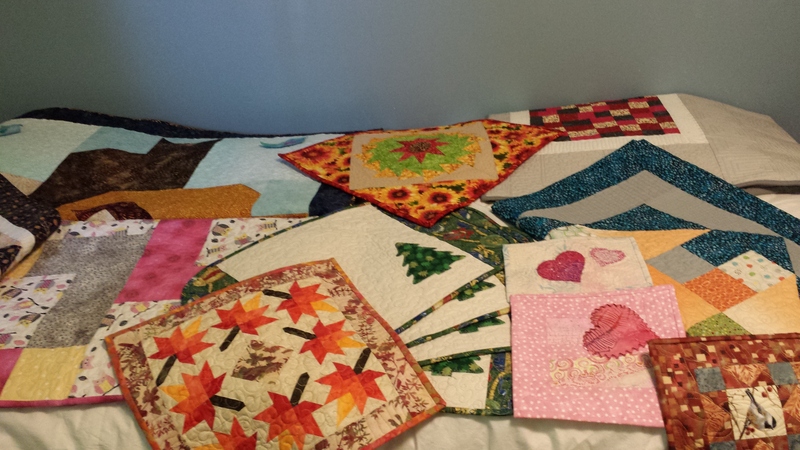 Just a reminder, these are quilts entered by many people from local towns as well as myself. 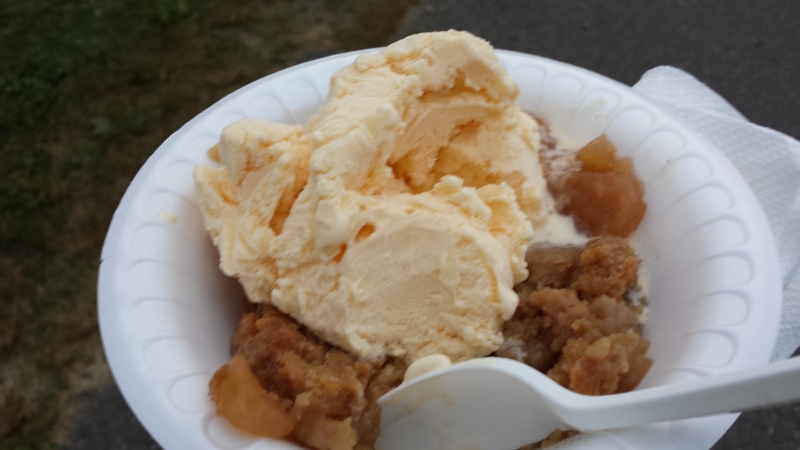 Also, I have to share a photo of my favorite fair food that I must have one time during the weekend, which is……….. warm apple crisp with a scoop of vanilla ice cream. YUMMMMM! This is the time of year around my house when everyone is getting ready for the Fair. 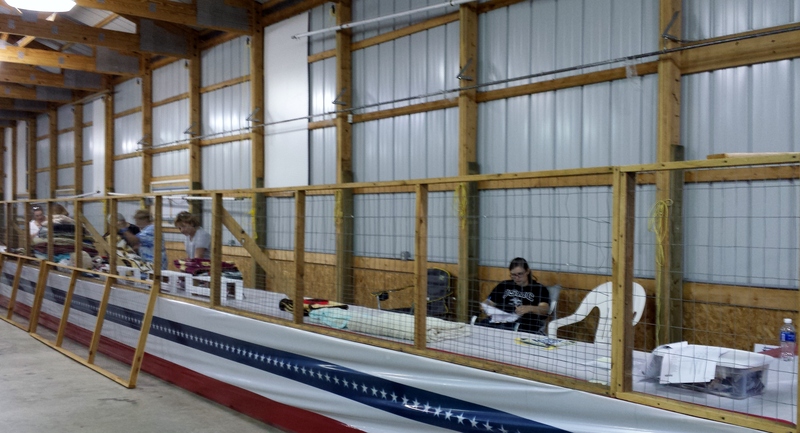 My husband is in the Lions Club and he spends much of the summer keeping equipment running and helping to prepare for their largest fundraising function, the Terryville Fair. It is classified as one of the major fairs of the Connecticut Agricultural Fair Association and it is held on the weekend before Labor day. The fair is open Friday, Saturday and Sunday but there is plenty of work leading up to it. I assist by taking in items in the Needlework department and I work in the Needlework area, answering questions, overseeing the exhibit during much of the fair. 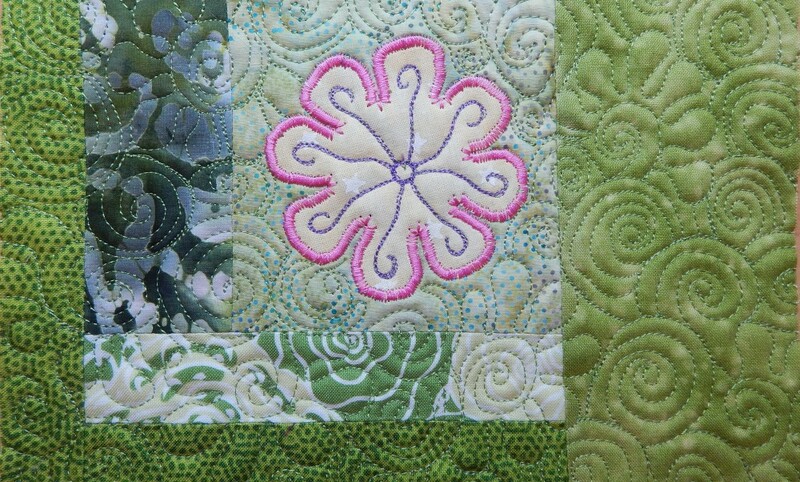 Since the Head of the Needlework dept and I are friends, and we spend so much time there over the weekend, we started bringing our sewing machines in with us and we work on quilt tops; that is when we are not visiting with the spectators or answering questions. We have one of the largest Needlework displays in the state! I will follow up next week with some pictures to give you an idea of what it is like. For today I will share these photos of some of the items that I have completed during the year which will be entered and displayed next weekend.